"An old man is brutally murdered while out for his morning walk on Mount Royal. Dissatisfied with the police investigation, his son, Elliot Forsman, is compelled to leave his criminology professorship so he can focus his fledgling PI practice on finding his father’s killer. Elliot and his partner, former policewoman Rivka Goldstein, track down the killer only to find themselves caught in a web of corporate conspiracy and hired mercenaries where even the local police cannot be trusted." "Gary Coffin is a career IT guy who currently lives near Ottawa (Ontario, Canada) in the bedroom community of Rockland Ontario with lovely wife Kristina. Gary and Kristina have three children only one of which is still living at home. The Elliot Forsman books take place in Montreal, one of the great cities in this world and the city that Gary grew up knowing." Elliot Forsman has a new PI business with his partner Rivka Goldstein. When his father is killed and the police set the case aside he decides to go after the murderer himself. He gets involved with Dr Banik of Biovonix - a pharmaceutical firm - and with the mercenaries who work for him, putting his own life, and Rivka's, in danger. He enlists the help of an old friend, Rayce Nolan, an expert on guns and knives and on how to outwit an enemy. Elliot is an interesting person, grieving for the death of his wife, starting up his new PI business and trying to find out why his father died. He is a courageous man, determined and focused. The characters in this novel are uniformly good, believable and layered. The narrative drive is compelling and the dialogue is realistic. 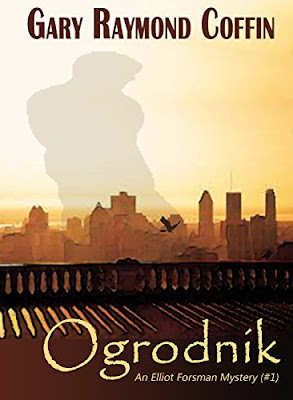 However it seems strange that the book is called "Ogrodnik," the name of one of the characters. There is a hint of why at the end but there are many sections of the book where Ogrodnik doesn't feature at all. Elliot is the main character and he holds the narrative thread together although there are times when the book seems to lose direction.
" . . . Rivka Replied.
" . . . like this,” Said Rivka with a bit . . .
"After I declined captain Brebouef for a couple of years . . . "
" . . . and the soldier spoke in a loud voice “Milos. Milos. Are you here?” In a thick eastern European accent as he walked down . . . "
" . . . beside the couch was Rivka’s Smith & Wesson, lying on the floor like a dead fish." Overall the book is really good and very enjoyable. It deserves 4 stars but the whole would work much better if the material was organised and had a further edit.